What is the matter with WalMart's screening process? They should never have allowed this seller at all, much less that product. Hey what are you doing? And it wasn't bad enough that the 'n-word' was in the product description on the first page, but it was also in the more detailed product description. It was even in the URL, something a simple filter would have prevented. Today, Walmart is apologizing and wondering how it could be possible that the terrible N-word landed in a third-party seller's description of a product intended to protect hair extensions. Well, gosh golly gee, Walmart! 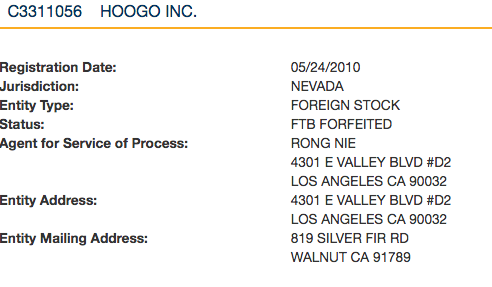 It took me all of 5 minutes to check out HOOGO, Inc, which is , but whose California corporate status is "forfeited" because apparently they haven't paid their sales taxes. They're also from the coupon affiliate website iCodes, which looks like it operates under a far smaller budget than WalMart. The owner of HOOGO, Inc. is a Chinese national by the name of Yanzhi Luo, who also has an account on Amazon under the name , whose listings do not include anything particularly controversial and certainly not racist. Amazon does screen their third-party sellers, though, and appears to have a filter on URLs so they're not permitted to contain racist epithets. It took me longer to write this up than it did to do that research, and I don't have anywhere near the resources as WalMart, so forgive me if their vapors over how a third-party seller's listings could POSSIBLY have landed on their website don't impress me. Do better, WalMart, or just admit your owners are a bunch of racist right-wingers who have no problem with that word.